China’s Long March-4C carrier rocket successfully orbited three satellites for scientific experiments on Saturday, the state-run Xinhua news agency reported. The launch took place at 3:37 Moscow time on Saturday [23:37 GMT on Sunday] from the launch pad in the Taiyuan Satellite Launch Center in Taiyuan, capital of north China's Shanxi Province. The three satellites - Chuangxin-3, Shiyan-7 and Shijian-15 - will be used “mainly for conducting scientific experiments on space maintenance technologies,” the agency reported. It was the 179th launch for a Long March rocket. In what was one of the most secretive Chinese missions in recent years, a Long March 4C launched three military satellites. 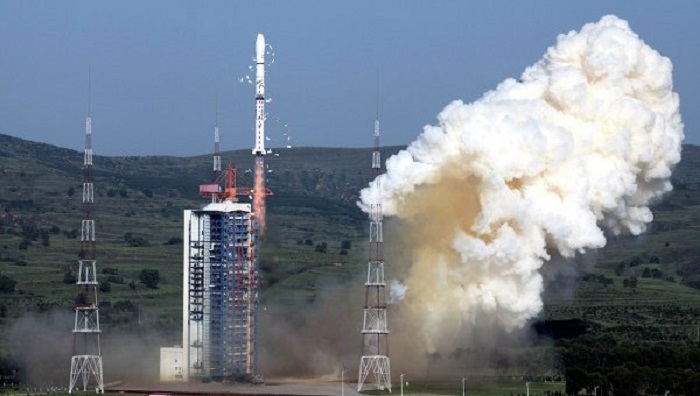 The launch, which occurred at 23:37 UTC from the Taiyuan Satellite Launch Center on Friday, was the subject of a state media blackout, with news leaking via social media just hours before lift-off. Chinese media refer to the new mission as launching three technological satellites: namely the Chuang Xin-3, the Shiyan Weixing-7 and the Shijian-15. The first Chung Xin (‘Innovation’) sats were experimental telecommunications microsatellites designed and built by the China Academy of Sciences. Shiyan Weixing satellites are usually used to test new technologies as well as the Shijian (‘Practice’) satellites used for technological demonstration. Shijian-15 probably will test a Chinese robotic arm, a mission that has been planned and announced for some time, while Shiyan-7 will scan for orbital debris. This was the 179th successful launch of a Chang Zheng (Long March) launch vehicle, the 42nd successful orbital launch from Taiyuan and the first from Taiyuan this year. It was also the fifth successful orbital Chinese launch in 2012. With its main commonality matched to the Long March 4B, the first stage has a 24.65 meter length with a 3.35 meter diameter, consuming 183,340 kg of N2O4/UDMH (gross mass of first stage is 193.330 kg). Situated in the Kelan County on the northwest part of the Shanxi Province, the Taiyuan Satellite Launch Center (TSLC) is also known by the Wuzhai designation. It is used mainly for polar launches (meteorological, Earth resources and scientific satellites). The center is at an altitude of 1400-1900m above sea level, and is surrounded by mountains to the east, south and north, with the Yellow River to its west. The annual average temperature is 4-10 degrees C, with maximum of 28 degrees C in summer and minimum of -39 degrees C in winter. TSLC is suitable for launching a range of satellites, especially for low earth and sun-synchronous orbit missions. The center has state-of-the-art facilities for launch vehicle and spacecraft testing, preparation, launch and in-flight tracking and safety control, as well as for orbit predictions.